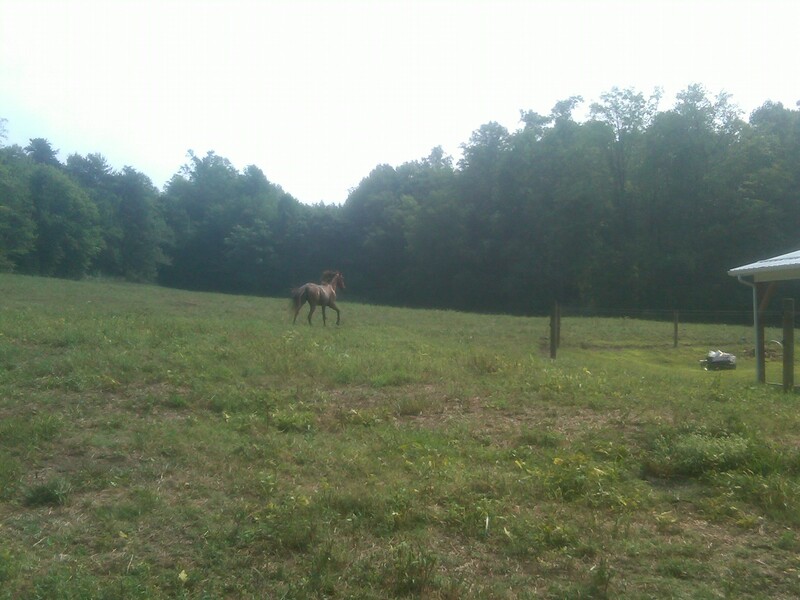 My husband and I returned home on Thursday and late that evening – after it cooled off – we picked our horse up at school and brought him home. He seemed happy to see us, kissed me first thing, and loaded up easily for the ride home. Our intention was to ride him the next day, but it was sweltering hot in the first part of the day, followed by thunder, lightening and huge downpours of rain. Some company dropped in, and I prepared a couple of homemade pizzas and fell into bed. Today, we decided to get up early and head to the barn. Caleb rode first, before I really got going, and then picked me up for a little training with the new head stall and bosal. This is as new to me as it is to Caleb, and we both trained on the gentle, slow horse – Ole Blue Eyes – the paint with the pretty blue eyes. He isn’t as tall as Choco nor is he as green. 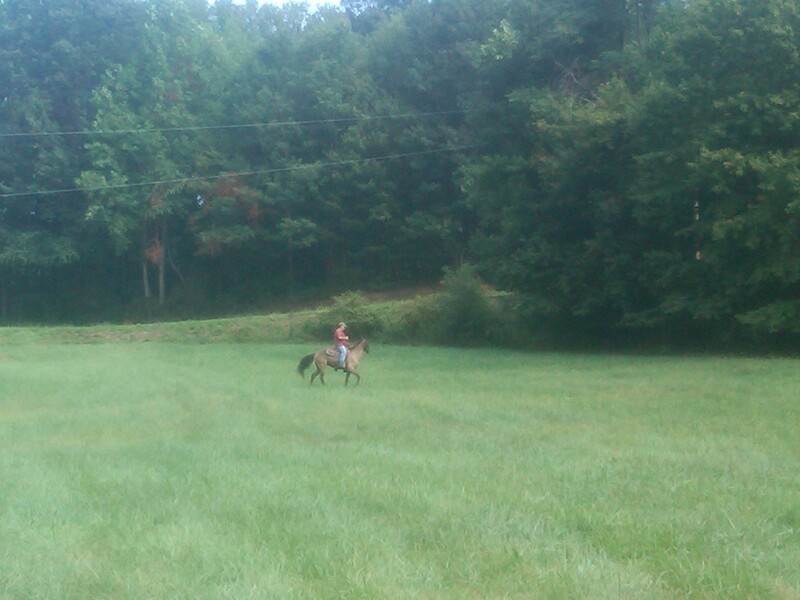 It will take a little getting use to, especially since I was taught to ride using a bit and neck reins. But the latest theory is that the bit is uncomfortable for the horse, so we had Choco trained with the bosal, which just adds pressure when you press on the reins. Tony, a more experienced rider and having ridden Choco at the school before bringing him home, decided to ride him. All of the tack is new and waxed and slippery, and he dropped one of the reins after taking off on him. The whip of it around Choco’s feet spooked him a little and he jumped – bucked – and threw Tony off. He hit the ground hard and Caleb and I ran to him. He had the breath knocked out of him, and said his chest hurt, but he got right up. 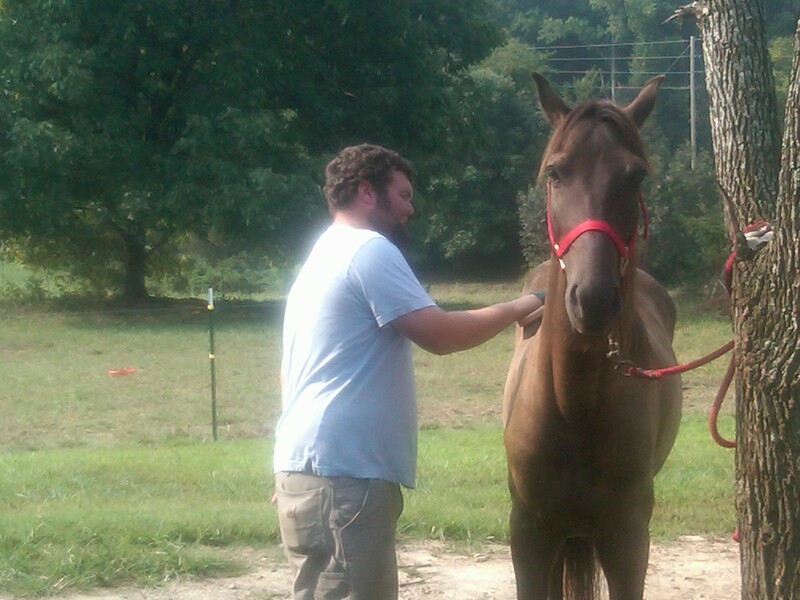 Caleb and I caught Choco, fixed the reins differently, and Tony saw something else he didn’t like about the gear. When everything was adjusted to suit him, he did what everyone knows must be done, but probably doesn’t want to do. 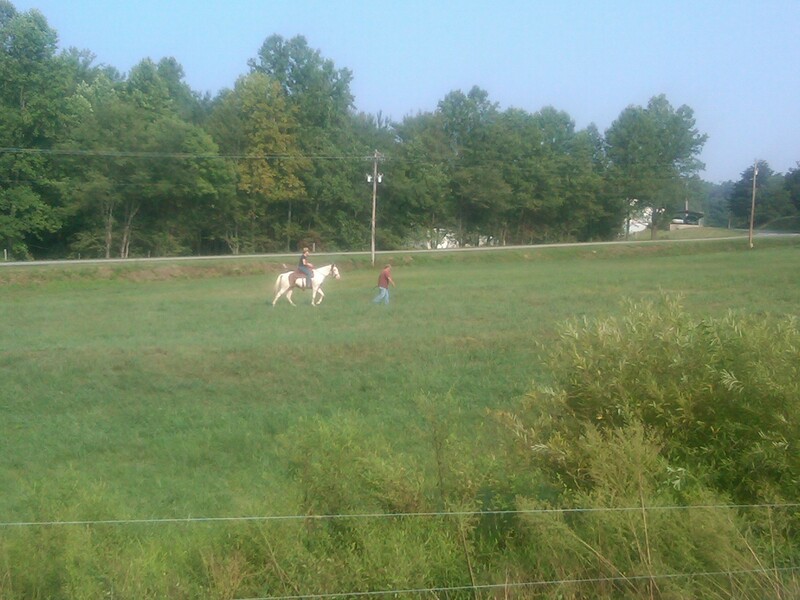 He got right back in the saddle and took off across the field. He says that it was his fault that he fell, and gave treats to Choco after he rode him successfully, but this was what I had hoped to avoid by putting our horse in school. Of course, that isn’t a cure-all for every type of spill, but we don’t need to be smashing into the ground from the height of the horse at our ages. It will take a little work – and hopefully not too many more tumbles – for all of us, including the horses, to get comfortable with the techniques. It brings a little of the west home with us as we ride with western saddles. He is beautiful. How old is he? I’ve never ridden with just a bosal. Will he graduate to a bit or will you leave him with just the bosal? I haven’t ridden in so long…really ridden! Space is sort of at a premium here in France and you just don’t see people riding except in the ring. I think he’s beautiful too, and very sweet. He is seven and we don’t really know how he was treated before we acquired him. The bucking was one of the things that we hoped to correct in school. I had never ridden with just a bosal – apparently it puts a little pressure on the nose and never requires a bit which experts say is irritating to the horse the entire time it is in. With the bosal, as soon as the horse follows the lead, you just let off the reins and the pressure stops. But every horse is different. As soon as we all adjust, there should never be anything else required. I didn’t think about the availability of wide open spaces in France. I guess it isn’t ideal for horse enthusiasts. But it makes up for that in soooo many other ways – all those wonderful things you get to do there!